#stampinup #faithfulinkspirations Earlier this month, I got a commission to make some holiday gift bags. I quickly mocked up a bag using some Naturally Eclectic Designer Series Paper and the Gift Bag Punch board, just so my customer could get an idea of how the bags would turn out. (You can see them here.) Not one to let a good thing go to waste, I decided to go ahead and finish the bag with a cute little tag. 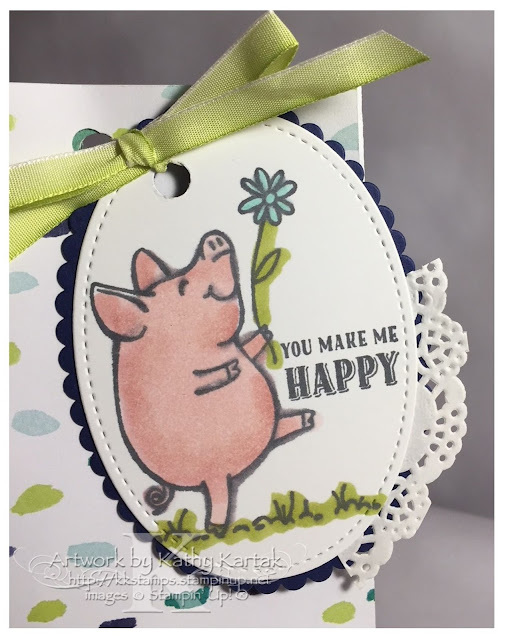 I stamped one of the adorable piggies from the "This Little Piggy" stamp set in Basic Gray Archival Ink onto a scrap of Thick Whisper White Card Stock. Then I got out my new Stampin' Blends alcohol markers to play with. What's that?! Stampin' Up has alcohol markers?! Why, yes, they do! Stampin' Up recently introduced high-quality, dual-tip alcohol markers in 12 exclusive Stampin' Up colors, each with a light and dark shade. Theses markers make it so easy to blend colors and create lovely works of art. Even I, who hates to color, love these markers--they make coloring and blending so easy! You can purchase them singly, or in a two-pack, or get all of them in one bundle! I used both the light and dark Pink Pirouette Stampin' Blend markers on the pig's body, the light Old Olive Stampin' Blend on the grass and stem of the flower, and light and dark Pool Party on the flower. 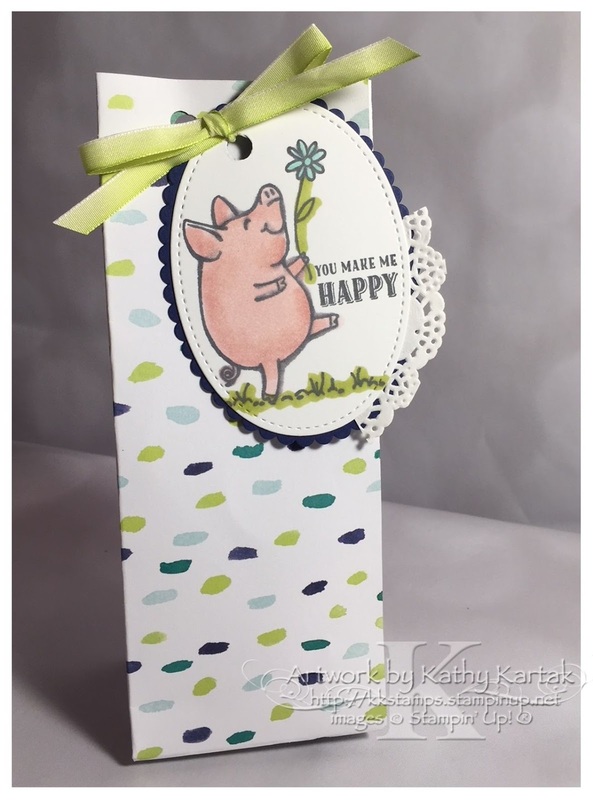 This is my first attempt using the Stampin' Blends and it turned out pretty cute, if I do say so myself. I need a bit more practice to get to a more expert level--but you can see what a novice can do with these awesome Stampin' Blends! After I colored the pig, I cut it out with an oval Stitched Shapes Framelit, attached a piece of Delicate Doily, and then adhered this to a Night of Navy scalloped oval cut with one of the Layering Ovals Framelits. I punched a hole in the top of the tag with the 1/8" Handheld Circle Punch and tied the tag onto the bag with a length of Lemon Lime Twist Ombre Ribbon. So cute!